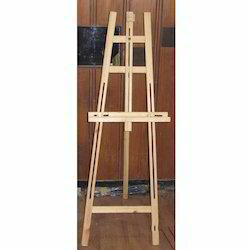 Our range of products include wooden easel stand. We are one of the pioneers of the industry for manufacturing, supplying a wide assortment of Wooden Easel Stand. The range of frames we offer is robust, durable and light in weight which makes them carry from one place to another. These frames are very suitable to store as they are non-corrosive and collapsible in nature. Moreover, these frames are available in market at very affordable rates.